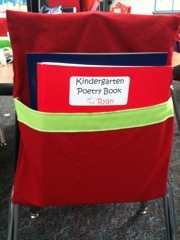 My mom made these beautiful chair pockets for my kindergartener’s chairs. I can’t wait to surprise my students with these on Monday! She bought the material from Hobby Lobby along with the gross grain ribbon in yellow, green and blue. I had an old and very worn chair pocket, given to me by a previous teacher. She used that as her pattern. 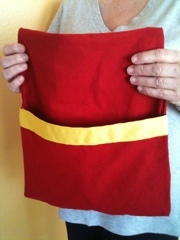 My mom was amazed to see video’s on You Tube and instructions on Google-for free. How wonderful to live in the information age! 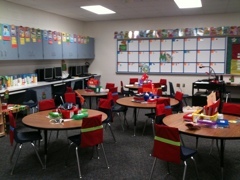 I am so excited that now my students will have a place to keep their reading, writing, math and science journals in. 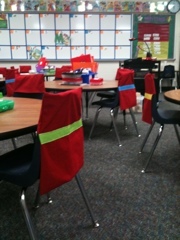 My mom came and unveiled the chair pockets, after school today. See the baskets in the middle of the table? 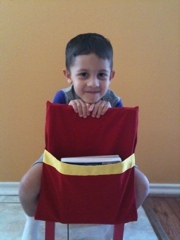 All those journals and folders will be in the chair pockets tomorrow-yeah! 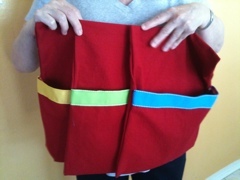 Thank you Mom, for sewing these amazing chair pockets!